Close to great shopping, on the bus line and an excellent place to call home at a price you can afford. The charm of loft living minutes from downtown on Madison's west side. For almost 50 years Johnson Properties has offered an exceptional variety of apartments, houses and commercial space for rent in Madison, Wisconsin. 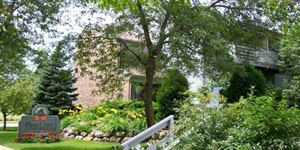 All of our Madison apartments are reasonably priced, clean and well managed. Excellent locations on Madison's west side. 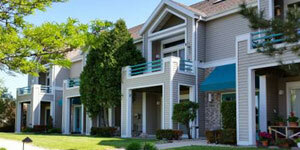 You'll notice a difference in our Madison apartments which are managed and maintained with pride by a local owner. Before renting a Madison west side apartment please take a moment to consider our outstanding apartment values. "You will not find a better value in Madison"
"I have truly enjoyed living at Blueberry Hill Apartments and would recommend them to friends." "Thank you for all the work you do on the property. I appreciate your caring" - A current resident of Pine Crest. 100% Occupied. Check back for future availability!! Large one bedroom loft on the ground floor available May 1st. Rent specials from $800.00 per month plus electricity. Best deal for a loft apartment on the west side. 700 sq. ft. The apartments have an open kitchen with a granite breakfast bar, updated light fixtures, vaulted ceilings, ceiling fan, and a patio. Tenant pays electric heat and lights. Great location near Woodman's Grocery store on the west side. Pine Crest is on a bus line. Cats allowed + $20 per month, sorry no dogs. Come check us out by setting up an appointment for a showing today! Large studio - 448 sq ft. $680 month. Fresh paint, all white, you have the option to choose a different color for two accent walls. Apartment has an open kitchen with a breakfast bar, dishwasher and large closets all along one wall. New carpet, new kitchen & bathroom floors, and new LED light fixtures!! Laundry is coin op just outside the door down the hallway. The patio faces west and has a great view of the construction of Exact Science's new location. On bus line just minutes from West Towne shopping center. $680.00 per month plus electricity (average $33 for previous tenant). Cats okay (extra $20 per month), sorry no dogs. Electric heat.